Fresh volcanic eruptions have been detected by Coast Guard personnel at Barren Island, 140 kms north east of Port Blair. Coast Guard ship Sagar and Dornier aircraft on patrol in Andaman and Nicobar seas have reported fresh eruption of lava and smoke on May 28 from the only live volcano in India on Barren Island, a Coast Guard release said here. The island, an uninhabitated place, is accessible only to Coast Guard and naval ships maintaining regular patrol in the area, it said. The volcano was dormant since last few years and there were no volcanic activity even after tsunami that struck the Indian coastal areas on December 26, 2004, it added. Eels and underwater volcano a good mix!? Scientist discovered eels living near that newly found underwater volcano. A University biology professor is part of a trailblazing mission to investigate a new underwater volcano growing in the Samoan chain. Traveling last month in a 7-foot-wide titanium bubble called a submersible, Oregon Institute of Marine Biology Director Craig Young said he saw unexpected varieties of wildlife that will be the subject of future research. "Nobody's ever taken a submersible to Samoa before," Young said. "It's exploration, just like Lewis and Clark." Hubert Staudigel, a geologist at Scripps Institution of Oceanography at the University of California, San Diego, and Stan Hart, a geochemist at Woods Hole Oceanographic Institution, had been studying the Vailulu'u volcano to monitor the movement of the earth's tectonic plates. Deposits of magma known as "hot spots" exist below these plates that make up the earth's surface, and they form volcanoes when they push upward. As the tectonic plates naturally shift, the portion of the plate that is on top of the hot spot changes, creating a new volcano. Staudigel compared this to shifting the position of a table underneath a leaky roof. "The most recent drop points to where the dripping is," Staudigel said. In the Samoan chain, the most recent drop is Nafanua, growing up inside the summit crater of Vailulu'u at an unusually fast rate. "This cone has grown hundreds of meters high just within the last two years," Young said. "It will eventually become one of the islands that people could live on." Staudigel said this volcano is currently at a critical juncture because, as underwater volcanoes approach the surface of the water, eruptions become more likely; in a process similar to the rush of bubbles when a soda can is opened, the gas within the magma is finally free to expand and explode. Another byproduct of this juncture is that iron and carbon in the magma meet with oxygen in the water, and the energy released in this oxidization process contributes to the growth of bacteria, which in turn become food for other organisms. "We saw much potential in looking at the biology of the system," Staudigel said, explaining why he recruited Young to join the project. As their submersible descended into the mouth of the volcano, Young and his cohorts were greeted with a slithering surprise. "(The submersible) immediately became surrounded by all these eels coming out of the cracks and crevices," Young said. Young said the usual assortment of animal life in such an area includes invertebrates such as clams and mussels, but all his team found were eels and microbials. "This is a totally different animal assembly than has been seen in a hot water system before," Young said. It is currently unknown why the volcano attracts such an unusual crowd. "Until we can catch one (of the eels), we won't even know what it is," Young said. "I'm sure they're doing something unique, whether or not they're a new species." Young said that the cruise in March and April, when the eels were discovered, was a three-day reconnaissance tour and that a trip involving eight all-day dives will be made in late June and early July. "That's where we'll do most of the research," he said. Most of Young's research takes place on deep sea dives in locations far from Oregon, including the Gulf of Mexico, the Arabian Sea, the North Atlantic Ocean, the Bahamas and Hawaii. He said undergraduate and graduate students frequently accompany him on his trips. Because of the high number of researchers from other institutions, the only other University representative present on the Vailulu'u trip was post-doctoral fellow Sandra Brook, who studies coral reefs. "We actually have funding for the students ... that we can't use because there's not enough berths for students," Young said. International collaboration was an important part of the expedition. In addition to scientists from the United States, Young said scientists from Australia and the United Kingdom were also involved. Adele Pile, senior lecturer at the School of Biological Sciences at the University of Sydney in Australia, has worked with Young since she was a post-doctoral fellow in his lab from 1997-98 and was co-leader with him on the biology portion of this project. She said in an e-mail that the Australian team's role in the research involves understanding the type and diversity of microbes around the volcano and mapping the habitat. "As each of us has a unique set of skills to bring to any project, Craig (Young) as a larval biologist and I as a microbial ecologist, the best way to answer the questions is through collaboration," Pile said in the e-mail. This is a similar underwater volcano that has been discovered recently. Craig Young has seen a lot of strange things living around the volcanic fountains of hot water that jet up from cracks in the sea floor. But what he found last month on an expedition to a newly discovered underwater volcano was the oddest thing yet. Instead of the more usual clusters of undulating tubeworms or a few ghostly, eyeless fish, Young and his fellow researchers found, for the first time ever, schools of wriggling, foot-long eels. "I was astounded, because it was the last thing in the world we would have expected," said Young, a professor and director of the University of Oregon's Institute of Marine Biology. "Nothing like this has been seen at all." Young was the co-chief scientist on the April expedition to the Vailulu'u volcano, a 14,000-foot-tall seamount in the South Pacific near American Samoa. He took part in one of three dives by the deep-sea submersible Pisces V that explored the Vailulu'u caldera, where eels weren't the only discovery. The research team, co-led by Hubert Staudigel of the Scripps Institution of Oceanography, also found a new, 1,000-foot volcano growing in the Vailulu'u caldera. Scientists first learned about it the night before their first dive, when sonar tracks found something big on what earlier soundings found to be a flat caldera floor. 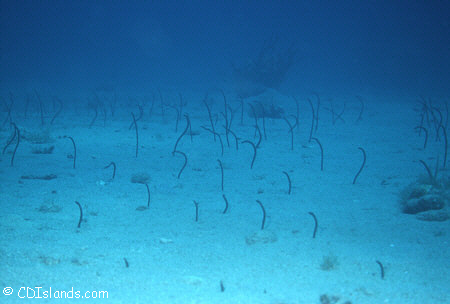 Eels, not the more typical tubeworms or clams, dominate the biological picture near Vailulu'u. "We were surprised that there was this new structure in the middle of the caldera," Young said. "Two years before, it had been a 1-kilometer deep, flat-bottomed caldera, and suddenly there's a mountain in the middle of it." The new volcano was named Nafanua after the Samoan goddess of war. Its discovery kept the geologists and geophysicists busy, but what interested Young were the eels. While it's not unusual to find a few small eels in colder water deep beneath the surface, it is unprecedented to find hundreds or perhaps thousands of eels dominating the biological community around a hydrothermal vent. Compounding the mystery is the near-total lack of any of the more typical organisms that populate such places, things such as tubeworms, mussels and clams. So, Young wonders, what do the eels eat? About the only organic material other than the eels were thick, yellow mats formed by microbes that feed off the chemical-rich water gushing from the vents, and he said it's anyone's guess whether that makes a meal for an eel. "So the puzzle to me is what are these guys doing for food," Young said. "To have (a vent) that just has microbial mats and fish seems very odd to me." The eels were found around vents near the top of the Nafanua cone - a site dubbed "Eel City" - where the 48-degree water is only about 10 degrees warmer than the surrounding ocean. So it could be that the eels are able to swim someplace else for food, Young said. Although the water from the top of the cone is relatively cool, the volcano probably is releasing much hotter water elsewhere. Hydrothermal vents can form chimneylike structures known as "black smokers," where the water temperature can top 700 degrees. Scientists learned Vailulu'u was active only recently, when they took water samples that showed large amounts of a kind of particulate matter produced by black smokers. Staudigel said the amount of particulate indicated perhaps as many as 50 black smokers, which Young said would make it "one of the hottest, most active hydrothermal systems in the ocean." But the team didn't find any high-temperature vents, probably because turbidity from the particulate formed a kind of volcanic fog around the base of Nafanua that reduced visibility to less than 10 feet. They hope to learn more when Young, Staudigel and other team members return for eight more dives in July, when they also will try to catch some eels to determine whether they are a new species. In the meantime, the volcano continues to grow at the rate of about 8 inches a day. The top of the caldera is 2,000 feet below the surface, and scientists say that in as little as a few decades, it could be close enough to the surface to become a hazard to ocean navigation. Staudigel said that's because as the volcano rises, the water pressure that acts like a cork to keep explosive eruptions in check decreases. That allows two things to happen: Gas comes out of the magma much faster and the heat from lava starts converting water to steam instantaneously, both of which add up to big explosions. Given the current slope of the volcano's flanks, it would take a tremendous amount of magma to build the volcano high enough to break the surface, Staudigel said. But it could easily top out at just 300 feet below the surface, right in the prime zone for explosive eruptions that could disrupt navigation or, should the volcano collapse like Mount St. Helens did, trigger a tsunami. "The chances are quite good that at some point it becomes explosive, but the chances of it actually forming new land is much less," Staudigel said. For Rosaly Lopes, watching a volcano spout smoke or staring into a bubbling pit of lava is the best adventure on earth. Lopes, who studies volcanos around the globe and throughout the solar system for NASA, wrote "The Volcano Adventure Guide" because people were always asking her for advice on visiting volcanos. The book explains the science and history of volcanos but also provides practical information about visiting volcanos in Hawaii, Iceland, Greece, Costa Rica, the Caribbean, the continental United States and Italy. Lopes explains how to stay safe, where to hike for the best views, and even lists other attractions nearby. In Italy, volcanos range from Mount Vesuvius, which has been dormant since 1944, to Stromboli, which has small eruptions every 20 minutes or so that are relatively safe to see from nearby. 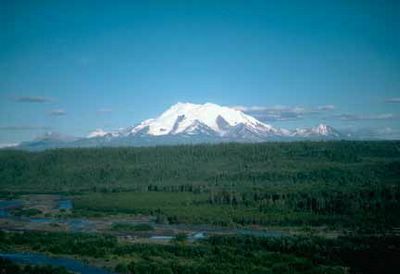 American sites include Mount St. Helens and Mount Rainier in Washington. "The Volcano Adventure Guide," a hardcover published by England's Cambridge University Press, is $50. Windward Islands Airways International (Winair) made history Tuesday morning when it landed at the brand new airport in Montserrat. The island and its population of some 4,500 have been isolated from scheduled air service since the eruption of the Soufriere Hills volcano in July 1995. The landing of the first plane in close to 10 years was witnessed by hundreds of people standing on the hill along the runway or on top of the roof of the airport building, clapping and cheering when the Twin Otter touched down. Captains Roberto Richie and Gavin Peterson smoothly put the aircraft down on the freshly asphalted 1,600-foot runway. The plane, with members of Winair’s management team and the media on board, was greeted by Chief Minister John Osborne and Airport Project Manager Claude Hogan. At the official ceremony that followed the landing, Osborne elaborated on the economic importance of opening up the 39-square mile island through Winair’s flights, which will be operating between Antigua and Montserrat for round trips starting July 11. He said “many people” were “afraid” to travel by sea, on the ferry between Antigua and Montserrat. The only other way to get to the island is by helicopter. The air service, Osborne said, will “open up” the island to the outside world and “boost” the local economy. “Not only from a historical, but also from an economical point of view this flight is of utmost importance. People must be able to depend on an airline,” he said, noting that the island was still recovering from the eruptions, developing infrastructure and hotels. “I am optimistic that we’ll make it, but it doesn’t take one day to rebuild a country,” he stated. “This first testing flight gives us hope for scheduled flights in the not too distant future. There are still a number of details to be worked out for the airport to meet the standard for commercial flights. Residents and visitors are looking forward to air service and we anticipate good service from Winair,” said Osborne. Winair’s Managing Director Edwin Hodge told those present at the ceremony that 10 years had passed since Winair’s last flight out of W.H. Bramble Airport in the east, which was destroyed by the volcano. He called the first flight both a “sentimental and operational journey,” mentioning that he had been on one of the last relief flights. Hodge promised the “best possible service” from Winair, an airline that he said had an “excellent safety record.” Winair won the bid to fly exclusively between Antigua and Montserrat for two years. Hodge announced special introductory fares and other benefits of Winair’s service. He said that in the future, depending on the demand, there would be direct flights between St. Maarten and Montserrat. The crowd at the ceremony responded positively to that announcement. Captains Richie, who brought the plane in Tuesday morning, and Peterson, who flew the Twin Otter out, said they had a “very positive impression” of the new landing strip and airport. They considered the landing strip in Montserrat of the same difficulty as the ones in Saba (1,200 feet) and St. Barths. They said this would restrict the destination to some pilots who have special training in short takeoff and landing procedures. The pilots made six landings in Montserrat Tuesday. The new airport at Gerald’s, opened by Princess Anne in February this year, has been built in the safe zone. To make the runway, which measures 600 metres, longer, the area at the end of the strip that goes downhill was filled up. A tunnel was constructed underneath the filled up part of the airstrip. Mexico's so-called "Fire Volcano" erupted on Monday spewing lava and glowing rocks for miles around in its biggest explosion since 1999. A huge grey column of smoke is billowing from crater of the 12,540-foot volcano in the western state of Colima. The "Fire Volcano" is located in a sparsely populated area about 300 miles from the Mexican capital. Local authorities had expected the eruption as the volcano has been in an active phase recently, with small eruptions daily. The last major explosion of the Volcano of Fire was in 1913, but it has erupted intermittently in the last decade. When Peter I. Kuniholm, professor of archaeology and dendrochronology and director of the Malcolm and Carolyn Wiener Laboratory for Aegean and Near Eastern Dendrochronology at Cornell, saw which tree rings held the highest gold levels, he quickly recognized that they dated to years of known volcanic eruptions. Because trees add a ring a year to their trunks, if researchers know the cutting date of a tree or can calibrate the tree's rings against a previously dated treeth, researchers can assign each ring accurately to a specific year. By isolated wood from just one ring, neutron activation analysis can measure the gold that the tree took up during that year with parts per billion sensitivity. Neutron activation analysis uses the neutrons produced by a nuclear reactor to create temporary radioactive isotopes in a sample. Because each isotope has its own gamma radiation signal, the gamma radiation signal strength indicates the amount of that element present. When Cornell's nuclear reactor at the Ward Center for Nuclear Sciences was shut down, Unlu moved the project, which was funded in part by the National Science Foundation, to Penn State's Breazeale Nuclear Reactor. The preliminary results of analysis of one tree for the years 1411 through 1988 were presented in a recent issue of the Journal of Radioanalytical and Nuclear Chemistry. Working with Kuniholm and John J.
Chiment, another researcher at the dendrochronology laboratory, and Corrnell undergraduate students Pam Sullivan, Meg Underwood and Danielle Hauck, Unlu analyzed 577 rings from a Bosnian or palebark pine from Greece. "We are looking at the last 500 to 600 years to gain confidence in the procedure," says Unlu. "The volcanic eruptions during that time are known, so we can make correlations. Then we will go back and look at the past 6,000 years." Six thousand years into the past is the depth of the samples currently at Cornell's dendrochronology laboratory. The lab has already dated approximately 4.5 million tree rings to this time. The researchers found that they successfully matched gold peaks to volcanic eruptions beginning with an eruption of the Soufriere Hills volcano in 1440 and including a 1480 eruption of Mt. St. Helens. However, the researchers also had high gold peaks for a number of years between 1480 and 1580 when there were no known volcanic eruptions. "When we see major gold peaks but no volcanoes, it could be forest fires," says Unlu. "We cannot really tell if we are seeing a global signal or a regional or local signal when we are looking at only one tree." How can a forest fire be confused with a major volcanic eruption? If the researchers are correct, easily. Unlu believes that the increased gold uptake during volcano years occurs because the volcanoes put large amounts of particulate matter into the atmosphere and change the environmental acidity as well as the rainfall, sunshine and temperature patterns creating a stressful situation for trees. The trees, to compensate for a lousy year, try to take up more nutrients, including copper, an essential element for tree growth and health. The gold is indiscriminately absorbed along with the copper, but the copper is used for tree metabolism while the gold remains in the new growth. Another possible cause of the increased gold uptake could be through the leaves because of direct fallout from the volcanic eruptions, but Unlu believes it is the darkness and stress that push the trees to search for copper among other elements. To eliminate forest fires and other local events, the researchers want to look at other trees from other areas. They are currently looking at two dated trees from Turkey and one from California. "The main problem in atmospheric science is they do not have enough data," says Hauck, now a graduate student in nuclear engineering at Penn State. "We want to correlate tree ring data with climate cycles to get a much better indication of what is natural and what is anthropogenic. Tree rings can help." Large volcanic eruptions put particles into the wind, into the jet stream and have a global, rather than only local effect. Unlu would also like to go back and check the samples with high gold for other elements. Because neutron activation analysis is nondestructive, and the samples are no longer radioactive after about a month, this reanalysis for other elements is possible. Unlu now has a Nuclear Engineering Education and Research grant from the U.S. Department of Energy to continue his analysis of tree rings and correlation to volcanic activity and other climate events. In Star Wars: Episode III Revenge of the Sith, Anakin Skywalker and his master Obi-Wan Kenobi duel on the piping-hot mining planet of Mustafar while dodging blasts of volcanic ash and lava. By studying the real volcanoes found on our own planet, the model makers and digital artists working in the Lucasfilm Art Department and Industrial Light & Magic were able to make Mustafar look like a real volcanic planet complete with rivers of molten lava. Now you too can get a better understanding of what it feels like to step foot on Mustafar with these interesting facts about the volcanoes found right here on Earth. How does a volcano form?Right underneath our feet there's a lot going on. The outer skin of the Earth is called the crust. Way below that (we're talking miles and miles and miles below the soil) is the Earth's mantle which is solid rock. But thanks to really high tempuratures and intense pressure, parts of this rock and various metals stay in a molten, liquid form called magma. When the pressure builds up, this superheated magma bubbles up through the Earth's crust, cracking the ground to make a vent or opening. Think of it as the top layer of a pie crust with hot fruit filling bubbling up through the pie holes. Over time, the lava that seeps out of these openings cools down and builds layer upon layer until it resembles a mountainous shape. What happens when a volcano erupts?The volcano has pent-up gasses below ground that need to escape through an opening. As the volcano erupts, fiery fragments, hot lava and ash burst out (as you saw briefly during Anakin and Obi-Wan's duel on Mustafar). The thick lava then slowly makes its way down the sides of the volcano, destroying anything in its path. Do all volcanoes erupt the same way?While some volcanoes explode with a super-burst of ash and lava, other volcanoes release lava so slowly that you could walk -- or lightsaber duel -- around them. Some eruptions can last hours or even days, and produce a towering, extended eruption that dumps a huge amount of "tephra" (cooled volcanic pieces and ash) that cover the surrounding area. What's good about volcanoes?The mineral and nutrient-rich volcanic materials found in cooled lava help the soil around it become fertile for a variety of trees and other plants to grow. While some volcanoes are used to produce energy, non-active volcanos can be mined for such materials as copper, lead, zinc, silver and gold. In Revenge of the Sith, Mustafar is known as a mining planet probably for those very reasons. The Mustafarians seen riding those platforms are harvesting the minerals directly from the lava. Can you live near them?Even though many countries that have volcanoes seem like the last place you'd want to live, many people can coexist with them without worry. In fact, the U.S. has a collection of volcanoes in the beautiful state of Hawaii, which is home to one of the largest volcanoes in the world at 13,000 feet above sea level -- Mauna Loa. Fire volcano erupts in Mexico. Mount Wrangell felt some tremors from Sumatra to Alaska, last December. Vanuatu Post has unveiled its latest headline grabbing mailbox, located on the slopes of the active and erupting Mt Yasur volcano.Thousands of visitors each year already drop into Vanuatu's now famous underwater post-office to mail a letter.Now tourists are being enticed to make the trek of the slopes of Mt Yasur to send some "hotmail. "Vanuatu Post's chief executive, Gary Ryan, says the volcano post box is not for the faint hearted. "The volcano is actually erupting 20 to 30 times per hour, minor eruptions, molten lava, very very hot place, and to have a postbox at this location it makes for an exciting time," he said. Twenty-five years ago, the bulging north flank of this mountain fell away in the largest landslide in recorded history. Stripped of its rock-and-ice corset, the volcano was suddenly semi-naked, its seething innards exposed to a fine spring morning.And then it blew.In an explosion heard 690 miles away in Canada, an ash-laden, superheated version of hell exited the mountain laterally and rioted northward at hundreds of miles per hour. It obliterated nearly everything in its path for 8 miles, sandblasting old-growth forests down to bedrock. As far as 19 miles from volcano, large evergreens were mowed down like grass. The lateral blast was followed by a vertical explosion of ash, enough to cover a football field-sized mound 150 miles high. The ash fell in measurable amounts in 11 states and soon circled the earth. Finally, mudflows overwhelmed local rivers, bullying their way down to the Columbia, where for weeks they blocked shipping lanes.It was the most destructive eruption in U.S. history and it killed 57 people - incinerating a few, mummifying some, crushing, drowning or asphyxiating the rest. With the exception of one volcano scientist, a few loggers and Harry Truman, an octogenarian innkeeper who refused to leave the mountain, most of those who died had no compelling reason to be near the mountain. They died as volcano tourists.The summit of Mount St. Helens is now 1,314 feet lower than it was on the morning of May 18, 1980. In many ways, though, the mountain's stature has soared during the past quarter century. It has become an icon of volcanic vulnerability in the Pacific Northwest. And its cataclysmic eruption, which caught many experts off guard, is widely regarded as the defining event in a worldwide push to use better technology to monitor volcanoes.Mount St. Helens is now wired so scientists and public safety officials can respond immediately to signs of trouble. These instruments have come in handy, as the volcano has awakened in recent months after 18 years of quiescence. It is energetically building itself a new lava dome and periodically belching great plumes of ash.Owing to the big blow in 1980, careful attention is being paid to some of St. Helens' older but still active cousins in the Cascade Range, two of which are near major population centers. Mudslides from Mount Rainier, which is far larger than St. Helens and much closer to Seattle and Tacoma, are regarded as such a serious threat that volcano evacuation routes have been established and school children near Rainier are regularly drilled in the art of running for high ground.The eruption of Mount St. Helens - filmed and photographed as it occurred - occasioned new insights into how volcanoes work. The most important lesson learned here, according to scientists at the United States Geological Survey (USGS), is that volcanoes, before they explode, tend to fall apart. "The reality that volcanoes fall apart was imprinted on all our brains in 1980," said Seth Moran, a USGS seismologist at the Cascades Volcano Observatory.Researchers have traveled to volcanoes around the world, evaluated the rubble pattern from old eruptions and concluded that Mount St. Helens, by the self-destructive standards of its peers, behaved rather typically.The blast zone has also become an ecological laboratory where researchers have overturned conventional wisdom about how lakes, meadows and forests recover from a catastrophic natural disturbance. "In 1980, we envisioned the recovery as a linear and predictable process," said Virginia Dale, a plant ecologist who was 28 and finishing graduate work at the University of Washington when the mountain erupted. "Now, that has all been thrown out the window. "In a paper published last week in the journal Science and in a forthcoming book, Dale and two other researchers summarize 25 years of recovery on the mountain. They saw lakes, opaque with ash and choked with debris, turn clear and quickly become nutrient-rich playgrounds for frogs, toads and salamanders, which somehow showed up in the inhospitable blast zone.In the first year after the eruption, as a handful of isolated plants called lupines emerged from avalanche debris, they saw honeybees "in the middle of nowhere, making a beeline to pollinate the plants," said Dale, who works at the Oak Ridge National Laboratory in Tennessee. They also saw trees behaving in ways that were contrary to botany textbooks.Dale, whose research was paid for by the National Geographic Society, said that western hemlock trees, which typically grow under heavy shade, outraced Douglas fir to sunny spots in the avalanche zone. "We thought some plant species would come in and die off, to be replaced by others in an orderly succession," she said. "What we found was everything was happening at once. It was humbling. "Timber operators, too, have been surprised. The eruption destroyed 68,000 acres of trees on private land owned by the Weyerhaeuser Corp. It also blanketed most of the singed forest with several inches of ash, which is mostly silica and contains none of the organic nutrients needed by conifer trees.Unsure what the ash might do, Weyerhaeuser decided to go ahead and replant, by hand, about 18 million Douglas fir seedling. Last week, ash was still thick on the forest floor, as Bob Keller, a Weyerhaeuser manager, showed off a thriving crop of trees that is pushing 70 feet in height. "We found that ash retained moisture and suppressed weed growth," Keller said. "This stand is taller and the diameter of the trees is greater than outside the blast area. It was a good investment to go back in and replant. "For many of the people who survived the eruption, the indelible lesson of Mount St. Helens seems to be that life belongs to the lucky. On the afternoon before the eruption, Mark Smith, then 20, entered the red zone that officials had established around the volcano. The state had cordoned it off in the early spring of 1980, when the mountain awoke spewing ash and steam. But on the weekend of May 17-18, they allowed local property owners to return and collect belongings.Smith's parents owned a lodge at the base of the volcano - not far from where their longtime friend, Harry Truman, was becoming an international media celebrity for his crotchety refusal to clear off the mountain. "On Saturday we went back to inventory the lodge and decide what we were going to haul down," said Smith, who remembers noticing the absence of birds and other wildlife on that visit. "The plan was for our family to come back the next day at 10 a.m. and collect our stuff. "The following morning, the Smiths were having breakfast at their home about 26 miles southwest of the mountain, when Mark's father strolled out to the porch, saw the sky darken with ash and announced, "It doesn't look like we're going back there today. "On Mount St. Helens, Truman was already dead and buried under hundreds of feet of rock. Scientists have speculated that prior to the landslide, he felt a cold wind off the mountain and was then incinerated.Mark Smith did not return to the site of his family's lodge for 20 years. When he did, there wasn't much to see. About 300 feet of rock lies on top of the lodge.Thinking about the eruption, Smith says he does not have any particular insight into why he and his family were spared. "We were just very lucky," he said. It's like driving a bus with blinders on. Pilots of the Hawaii Undersea Research Laboratory's two submersibles rely more on sonar than sight. The landscape they're canvassing is unforgiving. It's thousands of feet below the ocean's surface in hell's kitchen. "They're diving in a volcano that would be perhaps five times the size of Kilauea," HURL acting director John Wiltshire said. 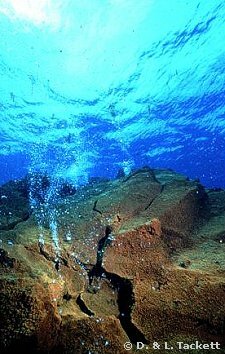 Volcano dives are nothing new but an exploration this extensive has never been attempted. The five-month project covers 20 volcanoes in the South Pacific from New Zealand to Tonga -- part of the earth's explosive "Ring of Fire." "They're going down in a submersible with two pilots and a scientist, going down into actively venting hydrothermal waters, some of which are coming out over 500 degrees Fahrenheit. The fact that anything survives is mind boggling. But the depths are teeming with underwater creatures that can stand the heat and tremendous pressure at the volcanoes' floor. The South Pacific zone is famous for frequent earthquakes and eruptions and breathtaking images. "They're seeing things they've never seen before," HURL's Rachel Shackelford said. Shackelford sees it secondhand. She catalogues the mountain of data the scientists send back. "Out of those water samples the scientists probably are going to be looking at gas concentrations, bacteria concentrations, different kinds of chemistry," Shackelford said. The ship and submersibles set sail in mid-March. They'll return in August loaded with treasures of the deep, samples from a part of earth that's out of this world. After 123 years of geologic tranquility, Mount St. Helens - the nation's youngest and most dangerous volcano - awakened with a mighty roar May 18, 1980.The historic blast transformed the picturesque, snow-covered Washington peak into a hell on earth, killing 57 people, spewing a dense cloud of volcanic ash more than 20 miles high, and triggering an avalanche of mud and debris that devastated more than 600 square miles of forests. Many stories about the mountain focus on the devastation of the ecosystem and its remarkable recovery - proof of nature's ability to destroy and regenerate itself. In his book "Echoes of Fury," award-winning investigative journalist Frank Parchman takes a fresh angle, telling the harrowing true tales of eight people - volcanologist Don Swanson, tree thinner Jim Scymanky, graduating student Peter Frenzen, adventurous photographer Robert Rogers, single working mother Donna Parker, campers Roald Reitan and Venus Dergan, and rookie newspaper reporter Andre Stepankowsky - whose lives suddenly and unexpectedly changed during and after the 1980 blast. The volcano awoke with an initial March 27 eruption. "Geologists said it was not a major eruption," Parchman notes in the book's prologue. "They disagreed on what would happen next. Some believed the mountain would have series of these minor eruptions and then return to its slumber. Others predicted a day of doom when the volcano would blow fire, smoke, ash, and rock into the air, and send floods of mud and melted snow into the valleys below. "Everyone now knows which view proved true.Parchman's extensive journalism background feature stints as staff writer, investigative reporter, and editor at a dozen daily and weekly newspapers and magazines in California, Oregon, Washington, and Tennessee. At the time St. Helens blew her stack, he served as public relations director at Emanuel Hospital in Portland. As he worked with families, hospital staff, rescuers, law enforcement officials, and the media during that time, Parchman gained a unique perspective of the unfolding drama.Now living in Redmond, Wash., Parchman took that human interest perspective to skillfully interweave riveting accounts about eight people whose lives were altered - and ultimately transformed - by the eruption and its aftermath.One of them - United States Geological Survey volcanologist Don Swanson - is haunted by guilt after switching shifts at an observation post with geologist David Johnston, who died in the blast. He went on to become the world's only scientist to predict volcanic eruptions with any degree of accuracy - not just once, but 15 times, sometimes to the day. Another - Andre Stepankowsky, a cub reporter for The Daily News in Longview, Wash. - became obsessed with the mountain's effects on the community. He helped the newspaper win a Pulitzer Prize for its eruption coverage, and is still there today as a seasoned city editor mentoring the news staff. The mountain still captivates Stepankowsky, especially since the unpredictable volcano recently rumbled back to life. As visitors mark the silver anniversary of the dramatic event, the mountain is again living up to its original name the Northwest Indians gave it: Smoking Mountain. "What every small, independent press needs once in a while is dumb luck and good timing," said Kent Sturgis, president of Epicenter Press, based in Kenmore, Wash., which published "Echoes of Fury." Founded in 1988, the regional press focuses on the arts, history, environment, diverse cultures, and lifestyles of the North Pacific and high latitudes.Parchman took five years to research and write, missed three deadlines, and worked with an editor for seven months, before giving the publisher a finished manuscript September 25, 2004. Three days later, Mount St. Helens stirred to life once more.Smoking Mountain remains active at USGS Alert Level 2, which means continued minor seismic activity, along with low emissions of steam, gases, and ash. Alert Level 3 is the most urgent volcano advisory, indicating the possibility of an eruption that threatens people and property.The mountain's renewed activity makes Parchman's book almost a must-read. It weaves an account of nature's raw power, survival, heartbreaking loss, the thrill of scientific discovery, the recovery of nature, and the healing of human bodies and spirits. "Echoes of Fury" is a terrifying reminder of nature's potentially devastating effects, and the need for humans to learn from the past and prepare for what will, inevitably, occur again.Scientists are keeping a wary watch on the hot-tempered lady, as Parchman indicates in the book's epilogue. They say the patterns of activity since Mount St. Helens rumbled back to life are "unprecedented." "Signs now indicate to scientists they could face an eruptive phase lasting years and possibly decades," Parchman writes. "Nearly every active volcano in the world has unique characteristics, often requiring scientists to customize their predictive tools. Even the same volcano can display different characteristics from one eruptive period to another. Predicting the future of the mountain is difficult. "Don Swanson believes volcanoes are often at their most dangerous when awakening from hibernation. And he is certain of one thing: another catastrophic eruption of Mount St. Helens as big as or bigger than 1980 is a question of when, not if. Mount St. Helens erupted for the rest of that day, blasting hot ash and gas 15 miles into the atmosphere and sending numerous pyroclastic flows down the flanks of the mountain. The landslide also generated a destructive mudflow that traveled all the way to the Columbia River. This slurry reduced the depth of the shipping channel in the river from 40 feet to 14 feet overnight and stranded numerous ocean-going vessels in upstream ports. In the 25 years since that fateful Sunday morning, the science of volcanology has dramatically changed, thanks, in part, to lessons learned from that eruption. Prior to 1980, the landslide and lateral blast had never previously been witnessed and were completely unknown to volcanologists. A similar landslide and blast occurred at Bezymianny volcano in Kamchatka, Russia, in 1956, but no people or cameras were there to document the activity. Only after the 1980 eruption of Mount St. Helens was the style of the Bezymianny eruption fully recognized. In fact, similar volcano landslides, called sector collapses, have now been identified at over 200 volcanoes around the world. Detailed studies of the sector collapse, lateral blast, and large mudflow at Mount St. Helens led to a reassessment of volcano hazards at other sites in the United States and around the world, better preparing communities situated near such volcanoes for possible future eruptions. In addition, studies of eruptions at Mount St. Helens following the May 18, 1980, explosion demonstrated that volcanic eruptions could indeed be accurately predicted. The growth of a lava dome in the newly formed crater between 1980 and 1986 provided an ideal natural laboratory with a series of repetitive "experiments" (eruptions) for scientists to observe. Through continuous monitoring and bold research by a team of interdisciplinary earth scientists using gas emissions, earthquake activity, surface deformation, and other techniques (many of which had been developed at HVO before their application at Mount St. Helens), 14 eruptions of lava between 1980 and 1986 were successfully predicted within days to weeks of their occurrence. This well-organized effort was made possible by the creation of the Cascades Volcano Observatory (CVO), based on the model of the Hawaiian Volcano Observatory, in existence since 1912. The experience gained from Mount St. Helens by CVO, along with the years of pioneering research at HVO, demonstrated the value of the observatory concept, where a group of scientists with different backgrounds could focus their efforts on understanding volcanic processes. Still, there is much progress to be made in understanding how volcanoes work, and why and when they will erupt. As the sudden, unanticipated reawakening of Mount St. Helens in September 2004 demonstrated, constant vigilance is essential for identifying and heeding signs of impending volcanic activity. Although we have learned much from the May 18, 1980, blast at Mount St. Helens and other eruptions, including the now 22-year-long eruption of Kilauea, volcanoes continue to challenge us, teaching new lessons with every eruption. Activity Update Eruptive activity at Pu`u `O`o continues. On clear nights, glow is visible from several vents within the crater and on the southwest side of the cone. The PKK lava tube continues to produce intermittent surface flows from above the top of Pulama pali to the ocean. Three ocean entries were active as of May 19. The two largest are at East Lae`apuki and East Kamoamoa, with a much smaller entry halfway in between. The East Lae`apuki and East Kamoamoa entries both have benches about 350 m (385 yards) long and up to 75 m (80 yards) wide. Surface flows are active intermittently inland of the entries. The East Lae`apuki entry is the closest activity to the end of Chain of Craters Road, in Hawai`i Volcanoes National Park, and is located about 4.5 km (3 miles) from the ranger shed. Expect a 2-hour walk each way and bring lots of water. Stay well back from the sea cliff, regardless of whether there is an active ocean entry or not. Remember-the beaches that sometimes form next to an active bench are just as dangerous as the bench itself. Stay off both, and heed the National Park warning signs. During the week ending May 18, 3 earthquakes were reported felt on Hawai`i Island. A magnitude 5.1 earthquake on May 13 at 0:06 a.m. was felt widely across the island. The event was located 5 km (3 miles) east-southeast of submarine Lo`ihi Volcano at a depth of 40 km (25 miles). A magnitude-3.2 quake occurred 14 km (9 miles) northwest of Na`alehu at a depth of 16 km (10 miles) at 5:14 a.m. on May 16; this earthquake was felt at Na`alehu. Another magnitude-3.2 quake occurred 1 km (0.6 miles) east-northeast of Pahala with a depth of 11 km (7 miles) at 6:28 a.m. on May 17; the quake was felt in the Volcano Golf Course area. Mauna Loa is not erupting. During the week ending May 18, 7 earthquakes were recorded beneath the summit area. Inflation has slowed beneath the summit and flanks over the last few weeks. Could retirement of a famous volcanologist slow down the study a volcano? About 18 months ago, geologist Cynthia Gardner hurried down a corridor of the Cascades Volcano Observatory in Vancouver, Wash. Management at the U.S. Geological Survey recently had bought a defibrillator and Gardner was late for her training session. Charlie Crisafulli sets out frog traps near Mount St. Helens. The ecologist says key scientists studying the area are close to the end of their careers. On her way, she saw a small group of junior, temporary contract scientists gathered in a room near the training area. Poking in her head, she gently admonished them, saying that as the only young people on staff, they better attend the training. It likely would be one of them, she said, who would save her or some other staff "geezer" in the event of a cardiac arrest. With hardly a pause, newly minted Ph.D. Mike Poland shot back: "But we need you to die. We want those jobs." Gardner laughed as she told the story, but it underscored a serious point: In recent years, budget restrictions have suspended nearly all of the hiring of scientists at the observatory, making the research center heavily dependent on Gardner and her colleagues who arrived in the aftermath of Mount St. Helens' major eruptions 25 years ago. And while those first-generation geologists built the observatory's volcanology into international prominence, many of them now are drifting toward retirement -- 66 percent of the staff will be eligible to retire by 2010, according to USGS records. This has placed the observatory on the cusp of losing much brainpower with no ready pipeline of junior scientists in reserve. When he left Vancouver three months ago, Poland was the last staff scientist at the observatory still in his 20s. Currently, only one permanent scientist there is in his 30s. "When I was at the CVO, I'm guessing the average age (of scientists) was in the 50s," said Poland, who did manage to land a rare permanent job with the USGS -- but in the Hawaii volcano observatory. "They weren't hiring. They couldn't. I was really lucky to get this job." Poland was correct in his estimate. The average age of Cascades Volcano Observatory scientists is 53, according to a staff survey. Gardner, 49, said it will prove to be a problem if not corrected. "When I arrived here in 1987, the roster here was close to 100 people," said Gardner, who now is the "scientist in charge" at the observatory. "Now it's half that, about 53 people. More importantly, we're losing senior staff and we're not able to replace them." The issue of an aging staff isn't confined to the observatory or even the USGS. The U.S. Forest Service also has begun to lose its senior St. Helens scientists. "Many of the people who arrived here (after St. Helens erupted) were midcareer," said Charlie Crisafulli, a research ecologist with the service's Pacific Northwest Research Station, based in Portland. "So those people now are in the waning years of their careers. "The question is what's being done to bring in their replacements? It's a concern." According to federal demographic studies, the concern extends to the entire federal government: 70 percent of the work force will be eligible for retirement in five years. With government science jobs, such as the within the USGS, the problem is acute, Gardner said. "We're starting to lose considerable, specific expertise," Gardner said. "You can't just hire in people to replace staff in some of these jobs. You need to train people." Professionally, geologists see natural history in great, sprawling chunks, in years bundled by the thousands, tens of thousands and millions. Two and a half decades -- the period since the eruption -- in most cases is inconsequential geologically, a teaspoon skimmed from time's ocean. But when it's a career, not a basalt deposit, the 25 years loom large. Not that long ago, St. Helens remained quiet, regarded as more mountain than volcano with its inner active life not yet revealed. Not a single government scientist was assigned to study it regularly. Then in March 1980, it began to vent steam and ash, sending dark smoke 17,000 feet in the air. Volcano scientists from Hawaii, Menlo Park, Calif., and Denver rushed in, setting up temporary offices in nearby Vancouver. Before St. Helens catastrophically blew its top 25 years ago today, sloughing off its north side and triggering a series of events that resulted in the death of 57 people, the two dozen USGS scientists on hand helped forecast the likelihood of the eruption. Much of this group stayed on to found the nation's second permanent volcano observatory. A budget that started at $1 million following that first year swelled to $20 million by the mid-1990s, according to observatory records. Since then, the budget mostly has been static. "We can't do a one-for-one replacement anymore," Gardner said. "That's the problem we're dealing with now." John Ewert, 44, is one of those first-generation geologists. He arrived as an undergraduate college student at the volcano in December 1980. A year earlier there had been no full-time geologist at the mountain. Now there were dozens. "When I came in," the volcanologist said, "I did a lot of different jobs. I had lot of on-the-job training, from gas measurements to surveying the crater and river channels. It was incredible." Many of the first scientists at the observatory had similar experiences. The study of volcanoes was nothing new, but many U.S. volcano geologists had never seen an eruption except in Hawaii. The issue isn't a small one: Volcanology remains among the most observational of sciences. The people who study volcanoes say one adage remains true: To find the best volcanologist, find the one who has watched the most eruptions. In the years after the St. Helens eruption, understanding of volcanoes and their hazards, particularly the explosive type that make up the Cascade Range, advanced dramatically. "For the science of volcanology, St. Helens was a watershed," Ewert said. "We learned a tremendous amount about the spread of ash and the nature of those explosive volcanoes." Crisafulli agreed. "More papers were published on Mount St. Helens than any other natural disturbance in the world. It's the poster child." Poland said much of what he studied at Arizona State University was based on research pioneered at the Cascades Volcano Observatory. Moreover, he said, when he got his chance to work at the center, it allowed him to work alongside the scientists who did much of the groundbreaking work. Not every young scientist, Poland observed, gets to work alongside the people who fundamentally moved their field forward. "I learned more in my time there than in all of my time at school," he said. "You can't teach this stuff. You have to go watch it for yourself. "I learned a tremendous amount just being around them. They brought up things I hadn't heard of." But attrition is taking its toll. The departure of volcano luminaries such as Dan Miller (retired in January but still has an office at the Cascades observatory) and Chris Newhall (retiring next August), among others, is imminent. Their protégés, staff members in their 40s such as Gardner and Ewert, won't have protégés of their own -- unless something changes soon. "A breadth and depth of knowledge is retiring out of the survey and there are few people around to benefit from their knowledge," Ewert said. "It creates a tremendous amount of pressure on us to keep that knowledge alive." 1979 — The mountain served as a recreational haven. About 500,000 people a year visited the Spirit Lake area below the cone-shaped, 9,677-foot summit. March 1980 — The volcano began to show signs of unrest. Earthquakes and steam eruptions continued for several weeks. 8:32 a.m., May 18, 1980 — The volcano exploded in a massive eruption and landslide, flattening 230 square miles of forest and killing 57 people. A plume of ash extended 15 miles into the sky and coated towns 250 miles away. Summer 1980-October 1986 — Repeated minor eruptions built a 925-foot-tall dome of hardened lava inside the crater left by the eruption. 1982 — Congress and President Reagan created the 110,000-acre Mount St. Helens National Volcanic Monument for research, recreation and education. Inside the monument, the environment was left to respond naturally to the eruptions. 1998 — The first major seismic activity since 1986 occurred, with earthquakes located as deep as 6 miles forcing magma to within about a mile of the dome, scientists said. 2001 — Another flurry of small earthquakes struck, but once again, no magma surfaced. Sept. 23, 2004 — The first of thousands of tiny, shallow earthquakes were recorded. Sept. 26 — The U.S. Geological Survey declared a notice of volcanic unrest, closing the crater and upper flanks of the volcano to hikers and climbers. Oct. 1 — The mountain briefly belched smoke and ash. The quakes subsided but resumed a short time later. Four more steam and ash explosions occurred through Oct. 5. Oct. 11 — Molten rock reached the surface, marking a new period of dome-building that had stopped in 1986. March 8, 2005 — An explosion shot gritty volcanic ash to about 36,000 feet. May 6 — The Johnston Ridge Observatory, five miles from the mountain, reopened. It had been closed since Oct. 2. Today — The 25th anniversary of the 1980 eruption. Is Mount Rainier the next one on the list of possible volcano eruptions? In the shadow of Mount Rainier, a father pushes his son on a squeaky swing set. A small dog sleeps undisturbed in the middle of a dead-end road. The tall firs lining the main street whisper in the spring breeze. One day, the peaceful hush of this small town will be broken by a rumble that sounds like a thousand freight trains. If everything works right, sirens will wail and the town's 4,400 residents will have less than 45 minutes to evacuate — or be buried by an avalanche of mud and debris tumbling off the flank of Mount Rainier.Scientists know that Mount Rainier, an active volcano, will one day awaken as Mount St. Helens did in 1980. It could gradually build up and explode, or part of it could simply collapse, perhaps with very little warning. It could happen in 200 years, or it could happen tonight. "People get burned by these kind of events because they think it can't happen in their lifetime," said U.S. Geological Survey vulcanologist Willie Scott. "We can't rule out a flow of troublesome size being generated almost at any time. "A mudflow would likely be troublesome indeed for Orting. Two rivers, the Carbon and the Puyallup, drain off the mountain, hug the town and converge just beyond it, putting Orting squarely in the mountain's strike zone. The town was built atop a 500-year-old mudflow that buried the valley 30 feet deep.Construction crews working on new housing developments for Orting's growing population have dug up massive tree stumps — the remnants of a forest buried there the last time Mount Rainier hiccuped. The USGS ranks Mount Rainier as the third most dangerous volcano in the nation, after Kilauea on Hawaii's Big Island and St. Helens, both of which are currently active. Other studies call Rainier the most dangerous volcano in the world — not just for its explosive potential, but because of the 3 million people who live in the Seattle-Tacoma-Bellevue metropolitan area. At least 100,000 people live on top of old Rainier mudflows that have solidified.Dawn So is one of them. When she moved to Orting from SeaTac two years ago, she didn't worry about volcanos or mudflows. She was just looking for a good place to raise her children and open a quilting store. "I wanted to have my kids in a better school district, a smaller town," she said. "I like to let them play in the front yard without having to worry about them. "She and her children have planned their escape routes, and she's confident they could get to high ground in time. But she doesn't spend much time thinking about Rainier's threat. "It's such a highly improbable situation," she said. "Disasters can happen wherever you're at. "Disaster could strike in at least three different ways. The mountain could go through a Mount St. Helens-type buildup, with magma rising in the mountain's core and then exploding, literally blowing Rainier's top and sending mudflows crashing down on the valleys below.Or, the magma could build up inside the mountain, never explode, but still trigger mudflows by weakening the rock and melting glaciers. Or, part of the mountain could simply collapse without any magma buildup, weakened by centuries of hot, acidic liquid coursing through the rock. Scott said the west flank of Rainier, overlooking the Puyallup River valley, is the oldest part of Mount Rainier and thus the most likely to collapse.In any case, rock and mud would mix with melted glaciers to create a flow with the consistency of concrete, moving as fast as 50 miles per hour. The mudflow would sweep down the valleys, picking up trees, bridges, and whatever else got in its way.Most of the mudflows — also called lahars — from Mount Rainier were triggered by an eruption, Scott said. But the most recent, the Electron mudflow that buried Orting 500 years ago, didn't seem to follow that pattern. "Maybe it was just a gradual weakening," Scott said. "That one sort of keeps us honest. "About 5,600 years ago the Osceola mudflow blanketed about 200 square miles northwest of the mountain. The flows reached as far north as Kent, a Seattle suburb, and drained west into Commencement Bay, now the site of the Port of Tacoma. The risk of catastrophe every couple thousand years hasn't stopped brisk development on ancient mudflows. But as scientists identified Rainier as a threat in the decades after Mount St. Helens' eruption, government officials and citizens have begun preparing.Last week, federal, state and local officials gathered at Fort Lewis for an exercise called "Cascade Fury III" — simulating the emergency response to an earthquake, eruption and massive mudflow from Mount Rainier. Are people really aware of the possible volcano eruptions in the USA? Twenty-five years ago today at 8:32 a.m. PDT, the continental United States was shaken by the massive eruption of Mount St. Helens in Washington. Within 15 minutes, an ash cloud rose 80,000 feet over the volcano. The blast knocked 3.7 billion cubic yards of earth, ash and rock off the mountain. A landslide triggered by the blast buried the North Fork of the Toutle River to an average depth of 150 feet (in some places, it was 600 feet). It's fury blew down or burned 230 square miles of forest. Ash fell within a 22,000-square-mile distance. The speeding cloud of death took 57 lives -- the most famous being the mountain's own curmudgeon named Harry Truman. Washington's State Department of Game estimated that 7,000 big game animals (bear, elk and deer) were killed as well as countless birds and small mammals. Lahars, rivers of volcanic debris, damaged 27 bridges, about 200 homes and destroyed 15 miles of railways and more than 185 miles of roads. It happened very quickly. Those too young to recall Mt. St. Helen's eruption can identify with the swiftness of its horror after seeing videos of the tsunamis that hit Asia and Africa last December. Americans tend to think of volcanos as a threat faced mainly by countries along the Pacific Rim. Yet the United States has 224 volcanoes (many are in Alaska). The eruption 25 years ago taught us a lesson that emergency plans must be in place. Scientists and other experts believe that is the case, especially with Mt. Rainier because it is within striking distance of 3 million people in the metropolitan Seattle area. After years of relative quiet and a rebirth of the land at the blast's ground zero, Mt. St. Helen's stirred back to life last September. Since then, it has puffed out a few ash clouds. Is this a volcanic burp or a warning of bigger things to come? Stay tuned. Mount St.Helen's last volcano eruption, 25 years ago. It happened on May 18, 1980. One hundred generations from now, the people of southwest Washington still will be grappling with Mount St. Helens.Still trying to predict the size and moment of its next eruption.Still balancing the need to keep a safe distance and the human passion to get close to danger.Still protecting cities from mudflows and volcanic muck. Still healing forests slashed by the mountain's magmatic fury.In their search for answers, those future Washingtonians will probably look to the dim past, to see how their 20th and 21st century ancestors coped with May 18, 1980.The people of this region, after all, did a dissertation on coping with disasters -- and have come to a deep understanding of how quickly geological forces can fire apocalyptic change, how a land of pristine beauty can become a smoking hell in just minutes. May 18, 1980, was just the beginning of a story that changed the destiny and face of southwest Washington forever.Mount St. Helens was called a disaster without an end. Even today, 25 years after the mountain exploded, the question still arises: How can a community live with the uncertainty that comes with being next door to one of the world's most active and dangerous volcanoes? For years following the eruption, engineers and bureaucrats asked whether cities along the lower Cowlitz River could continue to exist.In those years, any rainstorm swelled anxieties along with river levels. Would this be the storm that the river, clogged with volcanic debris, finally would come pouring over dikes, despite dredgers' best efforts? But what happened exceeded their worst-case projections.A 5.1 magnitude earthquake at 8:32 that morning gave the teetering north flank its final, fatal nudge. Within 10 to 20 seconds, the largest landslide in recorded history was hurtling toward Spirit Lake at speeds of up to 150 mph.The avalanche split into three parts as it rushed off the mountain.One smashed and filled in Spirit Lake, swamping the water nearly 700 feet up Mount Margaret to the north. When the water flowed back in, it washed thousands of trees and tons of mud into the lake.A second surge of debris hit the Toutle Valley bottom and then catapulted 1,000 feet uphill, topping what became Johnston Ridge and tumbling on into the next valley, that of South Coldwater Creek.The third surge rumbled westward down the north fork of the Toutle River, burying the upper 17 miles to an average depth of 150 feet. The eastern 20 miles or so of Spirit Lake Highway were buried forever. 'It's gonna get me, too'David Johnston, the young U.S. Geological Survey scientist, perished after blurting those excited, but not fearful, words into a radio from a vantage point five miles to the north: ''Vancouver! Vancouver! This is it! ''Eight miles northwest of the mountain, ham radio operator Jerry Martin watched the blast engulf Johnston's camp and the car of Vancouver Columbian photographer Reid Blackburn. ''It's gonna get me, too,'' Martin calmly uttered into his radio. That was the last anyone heard of Martin, who, like Johnston, never was found.The blast destroyed everything within about five miles north and west of the mountain, and it didn't vent its fury until it had laid waste forests up to 17 miles away. It left a narrow band of standing, but heat-killed trees ringing a blast zone of 230 square miles.Then came the mudflows. The blast was a kiln that melted tons of glacial ice and snow and sent concrete-like slurries sloshing down nearly every drainage on its flanks.The mudflows were like liquid freight trains, unstoppable forces that swept logs and log trucks, houses, bridges, cars and anything else downstream.Looming like a monster over all this destruction, a towering black column of ash shot up to 80,000 feet -- more than 15 miles -- and continued to churn out soot for nine hours. In all, the volcano spit 1.4 billion cubic yards of ash into the sky that day. What didn't fall to the earth circled the planet in 15 days.The land smoked and hissed, and foresters wondered if it would ever grow trees again in their lifetimes.Rivers were so clogged with silt that a routine storm would have sent the silt-engorged Cowlitz running out of control.Lakes dammed up by volcanic debris threatened to burst out and cause floods so catastrophic that they would be ''unprecedented in the history of the United States,'' to quote one government report of the time. The will to recoverCongress funded $1 billion for disaster relief, but politics and bureaucracy caused the bulk of the money to be spent elsewhere in the nation.A new Reagan administration in the White House resisted funding requests to dredge local rivers, and even local Republicans complained that the federal officials were more intent on balancing the budget than protecting lives and property in Cowlitz County.People seeking disaster aid got gummed up in red tape, because disaster assistance rules often didn't fit the circumstances of this tragedy. Residents fled the county, unable to cope with the uncertainty of flooding and continuing volcanic eruptions.It would have been easy to feel utterly dispirited.Instead, the people, scientists, engineers and officials of this region rebounded, matching the power of the volcano with an energy of their own.Local and state officials outwitted the White House to win a half-billion dredging and dike-building effort by the Army Corps of Engineers. Because of that work, when the Cowlitz rose to record levels in the floods of November 1995 and February 1996, Castle Rock, Lexington, Longview and Kelso rested comfortably behind the levees the engineers had raised or fortified. ''These communities are safe tonight because of Mount St. Helens,'' former Cowlitz County Commissioner Van Youngquist remarked while he watched the Cowlitz rise the night of Nov. 29, 1995. Communities around the world's other volcanoes also are safer because of Mount St. Helens. Geologists pioneered volcano forecasting here. Witnessing the May 18 eruption gave them a key to interpret deposits that mystified them at other volcanoes. They learned, for example, that volcanoes collapse and erupt laterally more often then they had earlier believed.Forests will be healthier because of lessons ecologists and foresters have learned at Mount St. Helens. Contrary to early impressions, scientists learned that the blast zone was still very much alive. Scientists noticed that the land rebounded much faster where plants and animals had survived underground or under snow or ice. This finding help lead to the development of ''New Forestry'' - a management philosophy that emphasizes preservation of remnants of the previous ecosystems when planning clearcuts and other land disturbances. So, the snags, rotten logs and standing trees left amid modern clearcuts to ''jump start'' ecological recovery can be traced back to Mount St. Helens.Coming back to lifeUntil last fall, when the mountain began rumbling again after a 19-year hiatus, it was easy to think we had ''done our time'' with the volcano. Not so.The mountain's lava dome is growing so rapidly that, if it continues, the youngsters of 1980 may see the volcano ''whole'' again. How neat - to live through an entire volcano ''rotation. ''How neat, also, to watch nature return. Volcanoes, though they are the bringers of chaos and destruction, are also nature's agent of renewal. Who, after witnessing nature rebound from May 18, can doubt the potency of the life force?And who, with the mountain perking again, needs to be reminded of that missive often attributed to Will Durant: ''Civilization exists by geological consent, subject to change without notice. ''The story of Mount St. Helens is far from over. For as long as people live in Southwest Washington, they'll have to contend with an active volcano. There will be more mudflows, more ash clouds and more eruptions -- perhaps more devastating than the one on May 18, 1980. The 1980 eruption of Mount St. Helens (VEI = 5, 1.2 km3 of material erupted) is the most significant volcanic eruption to occur in the lower 48 U.S. states in recorded history, exceeding the destructive power and volume of material released by the 1915 eruption of California's Lassen Peak (the 1912 eruption of Novarupta in Alaska was the most powerful historic eruption in the U.S.). The eruption was preceded by a two-month long series of earthquakes and steam venting episodes, caused by an injection of magma at shallow depth below the mountain which created a huge bulge and a fracture system on Mount St. Helens' north slope. An earthquake on May 18, 1980, caused the entire weakened north face to slide away, suddenly exposing the partly molten, gas- and steam-rich rock in the volcano to lower pressure. The rock responded by exploding into a super-heated mix of pulverized lava and older rock that sped toward Spirit Lake so fast that it quickly passed the avalanching north face. A volcanic ash column rose high into the atmosphere and deposited ash in eleven U.S. States. At the same time, snow, ice, and several entire glaciers on the mountain melted, forming a series of large lahars (volcanic mudslides) that reached as far as the Columbia River. Less severe outbursts continued into the next day only to be followed by other large but not as destructive eruptions later in 1980. By the time the ash settled, 57 people (including innkeeper Harry Truman and geologist David A. Johnston) and thousands of animals were dead, hundreds of square miles (mi²) reduced to wasteland, over a billion U.S. dollars in damage had occurred, and the once graceful face of Mount St. Helens was scarred with a huge crater open to the north. The area was later preserved, as it was, in the Mount St. Helens National Volcanic Monument. Several small earthquakes beginning as early as March 16, 1980, indicated that magma may have been moving below the volcano. Then on March 20 at 3:47 PM Pacific Standard Time (all times will be in PST), a shallow Richter magnitude 4.2 earthquake, centered below the mountain's north flank, definitely signaled the volcano's violent return from 123 years of hibernation. A gradually building earthquake swarm saturated area seismographs and started to climax at about noon on March 25, reaching peak levels in the next two days (a total of 174 shocks of 2.6 or greater were recorded during those two days). Shocks of 3.2 or greater occurred at a slightly increasing rate through April and May with five earthquakes of magnitude 4 or above per day in early April, and 8 per day the week before May 18. Initially there was no direct sign of eruption, but small earthquake-induced avalanches of snow and ice were reported from aerial observations. Then at 12:36 PM on March 27, at least one but possibly two nearly simultaneous phreatic eruptions (exploding groundwater-derived steam) ejected pulverized rock from within the old summit crater, excavating a new crater 250 feet (76 m) wide and sending an ash column about 6,000 feet (1800 m) into the air. Also by this date, a 16,000 foot (4900 m) long east-trending fracture system had developed across the summit area. This was followed by more earthquake storms and a series of steam explosions that sent ash 10,000 to 11,000 feet (3050 to 3350 m) above their vent. Most of this ash fell within 3 to 12 miles (5 to 19 km) from its vent but some was carried as far as 150 miles (240 km) south to Bend, Oregon, and 285 miles (459 km) east to Spokane, Washington. A second new crater and a blue flame were observed on March 29. The flame danced to and from the two craters and was probably created by burning gases. Static electricity generated from ash clouds rolling down the mountain sent out lightning bolts that were up to two miles (3 km) long. 93 separate outbursts were reported on March 30, and harmonic tremors were detected on April 3, alarming geologists and prompting the governor to declare a state of emergency. By April 8 the two craters merged, eventually creating one that was 1,700 to 850 feet (520 to 260 m) wide. A USGS team determined in the last week of April that a 1.5 mile (2.4 km) diameter section of St. Helens' north face was displaced out at least 270 feet (82 m). For the rest of April and early May this bulge grew 5 to 6 feet per day (1.5 to 1.8 m), and by mid-May it extended more than 400 feet (120 m) north. As the bulge moved northward, the summit area behind it progressively sank, forming a complex down-dropped block called a graben. Geologists announced on April 30 that sliding of the bulge area was the greatest immediate danger and that such a landslide may spark an eruption. These changes in the volcano's shape were related to the overall deformation that increased the volume of the mountain by 0.03 cubic mile (125,000,000 m³) by mid-May. This volume increase presumably corresponded to the volume of magma that pushed into the volcano and deformed its surface. Because the intruded magma remained below ground and was not directly visible, it was called a cryptodome, in contrast to a true volcanic dome exposed at the surface. On May 7, eruptions similar to those in March and April resumed, and over the next several days the bulge grew to huge proportions. All activity to this point was confined to the 350-year-old summit dome and did not involve any new magma. A total of about 10,000 earthquakes were recorded prior to the May 18th event with most concentrated in a small zone less than 1.6 miles (2.6 km) directly below the bulge. Visible eruptions then ceased on May 16, reducing public interest and consequently the number of spectators in the area. Mounting public pressure then forced officials to allow a limited number of people to enter the danger zone on May 17 to gather whatever property they could carry. Another trip was scheduled for 10 AM the next morning. Since that was Sunday, more than 300 loggers would not be working in the area. By the time of the climactic eruption, an estimated 0.11 cubic kilometers of dacite magma had intruded into the volcano. The rising magma forced the volcano's north flank outward nearly 500 feet (150 m) and heated the volcano's ground water system, causing many steam-driven explosions (phreatic eruptions). At 7 AM on May 18, USGS volcanologist David A. Johnston, who had Saturday night duty at an observation post about 6 miles (10 km) north of the mountain, radioed in the results of some laser-beam measurements he had made moments earlier. Mount St. Helens' activity that day did not show any change from the pattern of the preceding month. The rate of bulge movement, sulfur-dioxide gas emission, and ground temperature readings did not reveal any unusual changes that might indicate a catastrophic eruption. Without warning at 8:32 AM, a magnitude 5.1 earthquake (seismograph) centered directly below the north slope triggered that part of the mountain to slide an estimated 7–20 seconds (about 10 seconds seems most reasonable) after the shock. One of the largest landslides in recorded history, the slide traveled at 110 to 155 miles per hour (175 to 250 km/h) and moved across Spirit Lake's west arm; part of it hit a 1,150 foot (350 m) high ridge about 6 miles (9.5 km) north. Some of the slide spilled over the ridge, but most of it moved 13 miles (21 km) down the North Fork Toutle River, filling its valley up to 600 feet (180 m) deep with avalanche debris. An area of about 24 mile² (62 km²) was covered, and the total volume of the deposit was about 0.7 mile³ (2.9 km³). Most of St. Helens' former north side became a rubble deposit 17 miles (27 km) long, averaging 150 feet (46 m) thick; the slide was thicker a mile (1.6 km) below Spirit Lake and thinnest at its western margin. All the water in Spirit Lake was temporarily displaced by the landslide, sending 600 foot (180 m) high waves crashing into a ridge north of the lake and adding 295 feet (90 m) of new avalanche debris above the old lakebed, raising its surface level by about 200 feet (60 m). As the water moved back into its basin, it pulled thousands of trees felled by a super-heated wall of volcanic gas and searing ash and rock that overtook the landslide seconds before (see below). The landslide suddenly exposed the dacite magma in St. Helens' neck to much lower pressure, causing the gas-charged, partially molten rock and high-pressure steam above it to explode a few seconds after the slide started. Explosions burst through the trailing part of the landslide, blasting rock debris northward. The resulting laterally-directed pyroclastic flow of super-heated volcanic gases, ash and pumice from new lava, and pulverized old rock hugged the ground while initially moving at 220 mph (350 km/h) but quickly accelerating to 670 mph (1080 km/h) (it may have briefly passed the speed of sound). Pyroclastic flow material passed up the moving avalanche and spread outward, devastating a fan-shaped area 23 miles (37 km) across and 19 miles (30 km) long. In all, about 230 square miles (600 km²) of forest were knocked down within an 8 mile (13 km) inner fan area, and extreme heat killed trees miles beyond the blow-down zone. At its vent the lateral blast probably did not last longer than about 30 seconds, but the northward radiating and expanding blast cloud continued for about another minute. Super-heated flow material flashed water in Spirit Lake and North Fork Toutle River to steam, creating a larger secondary explosion that was heard as far away as British Columbia, Montana, Idaho, and Northern California. Yet many areas closer to the eruption (Portland, Oregon, for example) did not hear the blast. This so-called "quiet zone" extended radially a few tens of miles from the volcano and was created due to the complex response of the eruption's sound waves to differences in temperature and air motion of the atmospheric layers and, to a lesser extent, local topography. Everyone in the quiet zone did see the resulting huge ash cloud that was sent skyward from St. Helens' northern foot. The near-supersonic lateral blast, loaded with volcanic debris, caused widespread devastation as far as 19 miles (30 km) from the volcano. The area affected by the blast can be subdivided into three roughly concentric zones: Direct blast zone, the innermost zone, averaged about 8 miles (13 km) in radius, an area in which virtually everything, natural or artificial, was obliterated or carried away. For this reason, this zone also has been called the "tree-removal zone." The flow of the material carried by the blast was not deflected by topographic features in this zone. Channelized blast zone, an intermediate zone, extended out to distances as far as 19 miles (30 km) from the volcano, an area in which the flow flattened everything in its path and was channeled to some extent by topography. In this zone, the force and direction of the blast are strikingly demonstrated by the parallel alignment of toppled large trees, broken off at the base of the trunk as if they were blades of grass mown by a scythe. This zone was also known as the "tree-down zone." Seared zone, also called the "standing dead" zone, the outermost fringe of the impacted area, a zone in which trees remained standing but were singed brown by the hot gases of the blast. Later studies indicated that one third of the 0.045 cubic miles (188,000,000 m³) of material in the flow was new lava, and the rest was fragmented older rock. By the time this pyroclastic flow hit its first human victims, it was still as much as 680°F (360°C) and filled with suffocating gas and flying angular material. Most of the 57 people known to have died in that day's eruption succumbed to suffocation while several died from burns. Lodge owner Harry Truman was buried under hundreds of feet (tens of metres) of avalanche material. Volcanologist David A.
Johnston was one of those killed, as was Reid Blackburn, a National Geographic photographer. Subsequent outpourings of pyroclastic material from the breach left by the landslide consisted mainly of new magmatic debris rather than fragments of preexisting volcanic rocks. The resulting deposits formed a fan-like pattern of overlapping sheets, tongues, and lobes. At least 17 separate pyroclastic flows occurred during the May 18 eruption, and their aggregate volume was about 0.05 mile³ (208,000,000 m³). The flow deposits were still about 570°F to 785°F (300°C to 420°C) two weeks after they erupted. Secondary steam-blast eruptions fed by this heat created pits on the northern margin of the pyroclastic flow deposits, at the south shore of Spirit Lake, and along the upper part of the North Fork Toutle River. These steam-blast explosions continued sporadically for weeks or months after the emplacement of pyroclastic flows, and at least one occurred about a year later, on May 16, 1981. As the avalanche and initial pyroclastic flow were still advancing, a huge ash column grew to a height of 12 miles (19 km) above the expanding crater in less than 10 minutes and spewed tephra into the stratosphere for 10 straight hours. Near the volcano, the swirling ash particles in the atmosphere generated lightning, which in turn started many forest fires. During this time, parts of the now mushroom-shaped ash cloud column collapsed, sending additional pyroclastic flows speeding down St. Helens' flanks. Later, slower flows came directly from the new north-facing crater and consisted of glowing pumice bombs and very hot pumiceous ash. Some of these hot flows covered ice or water which flashed to steam, creating craters up to 65 feet (20 m) in diameter and sending ash as much as 6,500 feet (1980 m) into the air. Strong high-altitude wind carried much of this material east-northeastly from the volcano at an average speed of about 60 mph (100 km/h). By 9:45 AM it had reached Yakima, Washington, 90 miles (145 km) away, and by 11:45 AM it was over Spokane, Washington. A total of 4 to 5 inches (100 to 130 mm) of ash fell on Yakima, and areas as far east as Spokane were plunged into darkness by noon where visibility was reduced to 10 feet (3 m) and half an inch (10 mm) of ash fell. Continuing east, St. Helens' ash fell in the western part of Yellowstone National Park by 10:15 PM and was seen on the ground in Denver, Colorado, the next day. In time ashfall from this eruption was reported as far away as Minnesota and Oklahoma, and some of the ash drifted around the globe within about 2 weeks. During the 9 hours of vigorous eruptive activity, about 540 million tons of ash fell over an area of more than 22,000 mile² (60,000 km²). The total volume of the ash before its compaction by rainfall was about 0.3 mile³ (1.3 km³). The volume of the uncompacted ash is equivalent to about 0.05 mile³ (208,000,000 m³) of solid rock, or only about 7 percent of the amount of material that slid off in the debris avalanche. By around 5:30 PM on May 18, the vertical ash column declined in stature, but less severe outbursts continued through the night and the following several days. The hot, exploding material also broke apart and melted nearly all of the mountain's glaciers along with most of the overlying snow. As in many previous St. Helens eruptions, this created huge lahars (volcanic mudslides) and muddy floods that affected 3 of the 4 stream drainage systems on the mountain and which started to move as early as 8:50 AM. Lahars traveled as fast as 90 mph (145 km/h) while still high on the volcano but progressively slowed to about 3 mph (5 km/h) on the flatter and wider parts of rivers. Mudslides off the southern and eastern flanks had the consistency of wet concrete as they raced down Muddy River, Pine Creek, and Smith Creek to their confluence at the Lewis River. Bridges were taken out at the mouth of Pine Creek and the head of Swift Reservoir, which rose 2.6 feet (0.8 m) by noon to accommodate the nearly 18 million yard³ (13 million m³) of additional water, mud, and debris. Glacier and snow melt mixed with tephra on the volcano's northeast slope to create much larger lahars. These mudslides traveled down the north and south forks of the Toutle River and joined at the confluence of the Toutle forks and the Cowlitz River near Castle Rock, Washington, at 1:00 PM. Ninety minutes after the eruption, the first mudflow had moved 27 river miles (43 km) upstream where observers at Weyerhauser's Camp saw a 12 foot (3.7 m) high wall of muddy water and debris pass. Near the confluence of the Toutle's north and south forks at Silver Lake, a record flood stage of 23.5 feet (7.16 m) was recorded. A large but slower moving mudflow with a mortar-like consistency was mobilized in early afternoon at the head of North Fork Toutle. By 2:30 PM the massive mudflow had destroyed Weyerhauser's Camp Baker, and in the following hours seven bridges were carried away. Part of the flow backed up for 2.5 miles (4 km) soon after entering the Cowlitz River but most continued downstream. After traveling 17 miles (27 km) more, an estimated 3.9 million yard³ (2.98 million m³) of material were injected into the Columbia River, reducing the river's depth by 25 feet (7.6 m) for a four mile (6 km) stretch. The resulting 13 foot (4 m) river depth temporarily closed the busy channel to ocean-going freighters, costing Portland, Oregon, an estimated five million US dollars. Ultimately more than 65 million yard³ (50 million m³) of sediment were dumped along the lower Cowlitz and Columbia Rivers. The May 18, 1980, event was the most deadly and economically destructive volcanic eruption in the history of the United States. Fifty-seven people were killed and 200 homes, 47 bridges, 15 miles (24 km) of railways and 185 miles (300 km) of highway were destroyed. U.S. President Jimmy Carter surveyed the damage and stated it looked more desolate than a moonscape. A film crew was dropped by helicopter on St. Helens on May 23 to document the destruction. Their compasses, however, spun in circles and they quickly became lost. A second eruption occurred the next day (see below), but the crew survived and was rescued two days after that. In all, St. Helens released an amount of energy equivalent to 27,000 Hiroshima-sized atomic bombs and ejected more than 1 cubic mile (4 km³) of material. One fourth of that volume was fresh lava in the form of ash, pumice, and volcanic bombs while the rest was fragmented older rock. The removal of the north side of the mountain reduced St. Helens' height by about 1,313 feet (400 m) and left a crater 1 to 2 miles (2 to 3 km) wide and 2,100 feet (640 m) deep with its north end open in a huge breach. More than 4 billion board feet (14.6 km³) of timber were damaged or destroyed, primarily by the lateral blast. At least 25 percent of the destroyed timber was salvaged after September 1980. Downwind of the volcano, in areas of thick ash accumulation, many agricultural crops, such as wheat, apples, potatoes, and alfalfa, were destroyed. 1,500 elk and 5,000 deer were killed, and an estimated 12 million Chinook and Coho Salmon fingerlings died when their hatcheries were destroyed. Another estimated 40,000 young salmon were lost when they swam through turbine blades of hydroelectric generators due to the need to have low reservoirs levels along the Lewis River to accommodate possible mudflows and flood waters. The ash fall created some temporary but major problems with transportation, sewage disposal, and water treatment systems. Visibility was greatly decreased during the ash fall, closing many highways and roads. Interstate 90 from Seattle to Spokane was closed for a week. Air transportation was disrupted for a few days to 2 weeks as several airports in eastern Washington shut down due to ash accumulation and poor visibility. Over a thousand commercial flights were canceled following airport closures. Fine-grained, gritty ash caused substantial problems for internal-combustion engines and other mechanical and electrical equipment. The ash contaminated oil systems, clogged air filters, and scratched moving surfaces. Fine ash caused short circuits in electrical transformers, which in turn caused power blackouts. Removing and disposing of the ash was a monumental task for some eastern Washington communities. State and Federal agencies estimated that over 2.4 million yard³ (1.8 million m³) of ash—equivalent to about 900,000 tons in weight—were removed from highways and airports in Washington. Ash removal cost $2.2 million and took 10 weeks in Yakima. The need to remove ash quickly from transportation routes and civil works dictated the selection of some disposal sites. Some cities used old quarries and existing sanitary landfills; others created dumpsites wherever expedient. To minimize wind reworking of ash dumps, the surfaces of some disposal sites have been covered with topsoil and seeded with grass. Early estimates of the cost of the eruption ranged from US $2–3 billion. A refined estimate of $1.1 billion was determined in a study by the International Trade Commission at the request of the United States Congress. A supplemental appropriation of $951 million for disaster relief was voted by Congress, of which the largest share went to the Small Business Administration, U.S. Army Corps of Engineers, and the Federal Emergency Management Agency. There were also indirect and intangible costs of the eruption. Unemployment in the immediate region of Mount St. Helens rose tenfold in the weeks immediately following the eruption and then nearly returned to normal once timber salvaging and ash-cleanup operations were underway. Only a small percentage of residents left the region because of lost jobs owing to the eruption. Several months after May 18, a few residents reported suffering stress and emotional problems, even though they had coped successfully during the crisis. Counties in the region requested funding for mental health programs to assist such people. Initial public reaction to the May 18 eruption nearly dealt a crippling blow to tourism, an important industry in Washington. Not only was tourism down in the Mount St. Helens–Gifford Pinchot National Forest area, but conventions, meetings, and social gatherings also were canceled or postponed at cities and resorts elsewhere in Washington and neighboring Oregon not affected by the eruption. The negative impact on tourism and conventioneering, however, proved only temporary. Mount St. Helens, perhaps because of its reawakening, has regained its appeal for tourists. The National Forest Service and the State of Washington opened visitor centers and provided access for people to view the volcano's devastation. 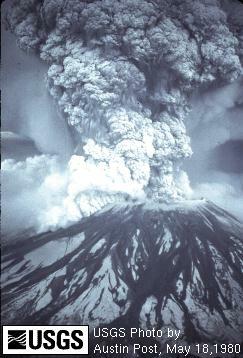 St. Helens produced five more explosive eruptions in the summer and fall of 1980. 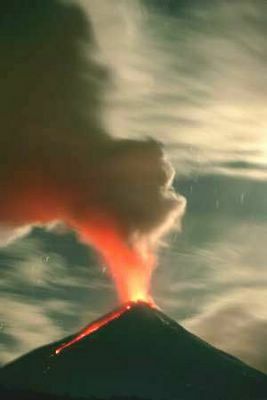 Through early 1990, a total of at least 21 periods of eruptive activity had occurred. An eruption occurred on May 25 at 2:30 AM that sent an ash column 9 miles (14 km) into the atmosphere. The eruption was preceded by a sudden increase in earthquake activity and occurred during a rain storm. Erratic wind from the storm carried ash from the eruption to the south and west, lightly dusting large parts of western Washington and Oregon. Pyroclastic flows exited the northern breach and covered avalanche debris, lahars, and other pyroclastic flows deposited by the May 18 eruption. At 7:05 PM on June 12, a plume of ash billowed 2.5 miles (4 km) above the volcano. At 9:09 PM a much stronger explosion sent an ash column about 10 miles (16 km) into the air. A dacite dome then oozed into existence on the crater floor, growing to a height of 200 feet (60 m) and a width of 1,200 feet (365 m) inside a week. A series of large explosions on July 22 broke more than a month of relative quiet. The July eruptive episode was preceded by several days of measurable expansion of the summit area, heightened earthquake activity, and changed emission rates of sulfur dioxide and carbon dioxide. The first hit at 5:14 PM as an ash column shot 10 miles (16 km) and was followed by a faster blast at 6:25 PM that pushed the ash column above its previous maximum height in just 7.5 minutes. The final explosion started at 7:01 PM and continued for over two hours. When the relatively small amount of ash settled over eastern Washington, the dome built in June was gone. Seismic activity and gas emission steadily increased in early August, and on August 7 at 4:26 PM, an ash cloud slowly expanded 8 miles (13 km) skyward. Small pyroclastic flows were sent through the northern breach and weaker outpouring of ash rose from the crater. This continued until 10:32 PM when a second large blast sent ash high into the air. A second dacite dome filled this vent a few days later. Two months of repose were ended by an eruption lasting from October 16 to October 18. This event obliterated the second dome, sent ash 10 miles (16 km) in the air and created small, red-hot pyroclastic flows. A third dome began to form within 30 minutes after the final explosion on October 18, and within a few days, it was about 900 feet (275 m) wide and 130 feet (40 m) high. All of the post-1980 eruptions were quiet dome-building events, beginning with the December 27, 1980, to January 3, 1981, episode. By 1987 the third dome had grown to be more than 3,000 feet (900 m) wide and 800 feet (240 m) high. At this rate and assuming additional destructive eruptions do not occur, St. Helens' summit should be restored sometime in the mid to late 22nd century. In September–October 2004, however, St. Helens came back to life, and as of Oct. 2, scientists are anticipating another eruption. See the main Mount St. Helens article for the most recent updates.